Washington: Fences have risen around kindergartens. Special vehicles transport military personnel to their work sites. Residents of the island settlement are afraid to leave their homes. Novaya Zemlya is a Russian archipelago stretching into the Arctic Ocean. It once played host to Soviet nuclear tests, including the largest-ever man-made explosion, when the so-called King of Bombs detonated in 1961, releasing 50 megatonnes of power and deepening an arms race that threatened to turn the Cold War hot. Today, the barren landscape is under siege – from dozens of polar bears locked in their very own sort of hot war. Marine ecologists have long been sounding the alarm about the peril posed by global warming for the vulnerable species. In the far reaches of Russia, the situation has suddenly become traumatic for humans, too. At least 52 bears were massed near Belushya Guba, the main settlement on the island territory, which is still used as a military garrison, with restricted access to the public. The town had a population of about 2000 as of the 2010 Census. Now, the bears could be selectively slaughtered if Russian authorities can't figure out another way to keep them from menacing the residents of the remote island outpost, where they began to collect in December 2018. 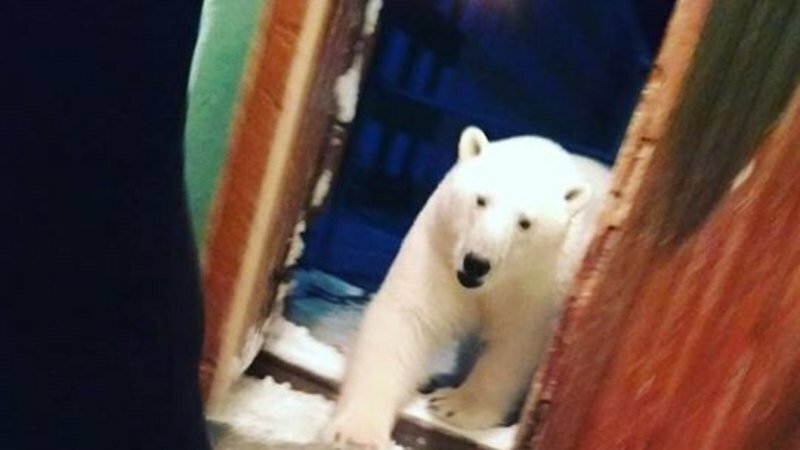 Warning of the "mass invasion of polar bears in residential areas," local officials vowed action in response to "numerous oral and written complaints demanding to ensure safety in the settlement." "I have been in Novaya Zemlya since 1983, but there has never been so many polar bears in the vicinity," said Zhigansha Musin, a local administrative head, according to TASS, Russia's state news agency. TASS reported that the animals had tried to enter office buildings and residential quarters, and that they had chased residents and engaged in other aggressive behaviour. Photos and video footage posted over the weekend showed polar bears parading through drab living spaces, appearing on playgrounds, staring down dogs and feasting on garbage. So far, Russia's environmental watchdog has withheld licences for shooting the troublesome animals. Instead, a team of experts is being sent to the remote island community to try to protect the residents. "However, provided that those measures do not help solve the situation, a cull will remain the only and forced answer," TASS reported, suggesting that killing the animals as a means of population control was possible. The polar bears are battling adverse conditions of their own, driven by changing conditions in the Arctic, which is warming more than twice as fast as the rest of the planet, according to a 2013 study in the journal Nature. Models suggest that arctic sea ice is declining at a rate of nearly 13 per cent per decade. Scientists also pointed to climate change as the reason for the aggressive behaviour of a sloth of polar bears that surrounded a weather station in the Arctic in 2016, threatening a team of Russian researchers. But a garbage-based diet won't properly nourish polar bears, whose energy demands require "high-fat prey," as detailed in a 2014 paper in the journal Science. The marine animals are highly vulnerable to climate change, the authors found, because of their dependence on icy conditions in acquiring their preferred fare, seals, as well as other animals that sustain them, including fish and waterfowl. When a polar bear's carnivorous needs aren't met, or when it has to travel further and faster to sate itself, its body condition suffers. A female's reproductive capacities may falter. The US Geological Survey warned in 2007 that two-thirds of the global population of polar bears could be wiped out by 2050 because of thinning sea ice. The Canadian photographer described the scene as "soul-crushing," but said he was moved to share it in an attempt to "break down the walls of apathy". The invasion in Russia, in testing the nerves of the local population, is also testing how firmly those walls stand.